March 10th was a day that brought with it much excitement and some nervousness, as I headed off to the UN Commission on the Status of Women (CSW) for the second time in my life. My enthusiasm was natural, as this is the largest annual gathering of women’s rights activists worldwide – in 2017, 162 Member States and about 4000 civil society representatives from 138 countries gathered in New York. My anxiety was a result of the US travel ban, even though Pakistan was not on the list; luckily I got into the country without any drama. The next day was the Ecumenical Women’s orientation which began by remembering those who could not be at the CSW due to the travel ban. The worship session held at the Chapel of the Church Center of the UN (CCUN) ended with chants of Assalam o Alaikum! It was an amazing experience in an inclusive space where everyone was welcome. Later that day I got a chance to meet and work with amazing colleagues from the ACT sister agencies. The close collaboration within ACT, prior to and during the CSW, was one of the main strengths of our gender and advocacy work. The ACT office at the CCUN became our home over the next week, where Jillian Abballe and Rudelmar Bueno de Faria from the World Council of Churches assisted with a variety of tasks, from printing documents to finding space for an important discussion. From the ACT side, I was grateful for the guidance of Gunilla Hallonsten and Anoop Sukumaran, as well as Elsebeth Gravgaard (DanChurchAid). Despite the blizzard, ACT was able to host its side event at the UNFPA on the 14th, with very strong attendance! During the CSW, it became evident that the appetite for engaging with faith and faith communities is increasing in the donor community and the UN. A lot of diverse groups seem to be interested in this trend and some are jumping on the bandwagon – which brings with it the challenge of the potential for ultra-conservative forces to hijack this positive development. This reminded me of Norwegian Church Aid’s Gender based Violence program in Pakistan and how we used to remind partners to encourage religious leaders to use their platforms for our messages (on gender equality) rather than the other way around! The CSW side events underscored the need for alliances between progressive elements from various faith backgrounds – the MUSAWAHs and the ACT Alliances of the various faith backgrounds and religions. This was also one of the key messages of the ACT delegation, that progressive faith based organizations can counter the misuse of religion by certain groups that undermine the rights of women and girls and play a positive role to achieve gender justice. While lobbying and learning about how the negotiations were progressing (a colleague was also on the official delegation), the need for clear communication between partners and for devising strategies to overcome politics was reiterated. CSW 61 was also very special as Anoop Sukumaran was able to deliver an oral statement on behalf of ACT at the General Assembly, raising our concerns about sexual and reproductive health rights, gender based violence and the shrinking space for civil society. After returning, I did hear some worrying news about restricted NGO access (as mentioned here). To stay positive, I recalled a memory from last week, one of hope and the importance of working from within. At the Launch of a Platform on “Gender Equality and Religion for the Gender Responsive Implementation of the 2030 Agenda for Sustainable Development” (where ACT was represented by Clare Paine from Christian Aid) I met Dr. Fadilah Grine. She is the Director of Social and Family Affairs in the Organization of Islamic Cooperation (OIC), an association known for its patriarchal views, but with such a strong Muslim woman constantly pushing boundaries internally and externally, I felt there was hope for us. Staying positive is important for any advocacy initiative. Later that day I was surprised to learn that the UN CSW 61 Agreed Conclusions were adopted by consensus, as there had been talk that this would not happen at all. Unfortunately, the conclusions did not strongly embrace sexual and reproductive health and rights, or address the shrinking space for civil society. To me this was a reaffirmation we, as faith communities, have vital work to do in this debate, and that we must work more closely behind the scenes with those who disagree with us. It has been an honour to be a part of this journey and I am sure the lessons learned this year will help ACT accomplish even more in the year to come! Rabia Waqar is a feminist at heart and development practitioner by profession. She has worked for American and European organizations in Pakistan, managing their GBV and Girls’ education programs. She has a Masters degree from Columbia University on a Fulbright scholarship, when she was also selected for Merrill Lynch’s Women’s International Leadership Program (2007-08). 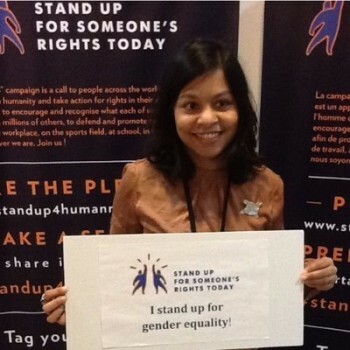 Rabia Waqar has been with NCA in Pakistan for 5 years, managing the GBV program there and is currently based in Oslo.